Welcome to the TWISTED PIZZA CO. website! 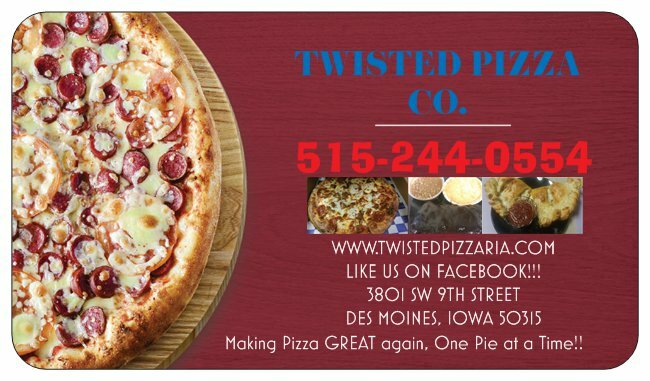 TWISTED PIZZA CO. is the place for fine dining in DES MOINES. Come to TWISTED PIZZA CO. and experience our high-quality food and service. We offer Delivery for South side , Downtown, West Des Moines, Johnston, Norwalk, Urbandale, Windsor Heights, and Surrounding areas!!! We Deliver all over Des Moines, West Des Moines, Altoona, Norwalk, and surrounding areas. © 2018. TWISTED PIZZERIA. All Rights Reserved.